Autumn Gem Preview for the iPad is available on the App Store! Experience the amazing story of the “Chinese Joan of Arc,” Qiu Jin, a real-life woman warrior who defied tradition to become the leader of a revolutionary army against the corrupt Qing Dynasty. Qiu Jin boldly challenged traditional gender roles and redefined what it meant to be a woman in early 20th-century China. Note: Due to the size of this application, we recommend that you download Autumn Gem Preview on a WiFi connection or from iTunes. 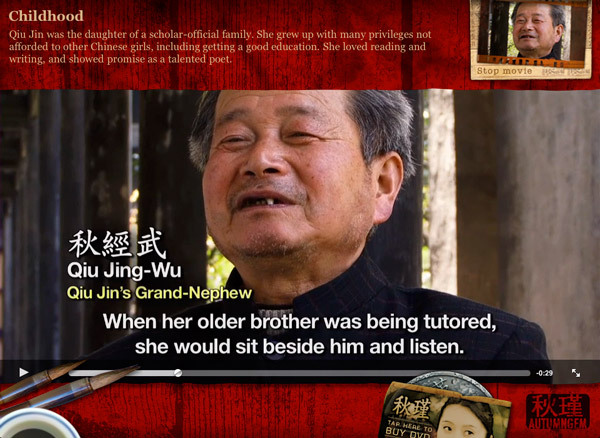 AUTUMN GEM: A Documentary on Modern China’s First Feminist explores the extraordinary life of Qiu Jin (1875 – 1907). A passionate advocate for women’s rights, Qiu Jin dedicated herself to the fight for equality. She was the first woman to lead an armed uprising against the imperial dynasty. Captured before she could carry out the plot, she was accused of treason and executed, becoming the first female martyr for China’s modern revolutionary cause. Qiu Jin is celebrated as a national heroine in China today. 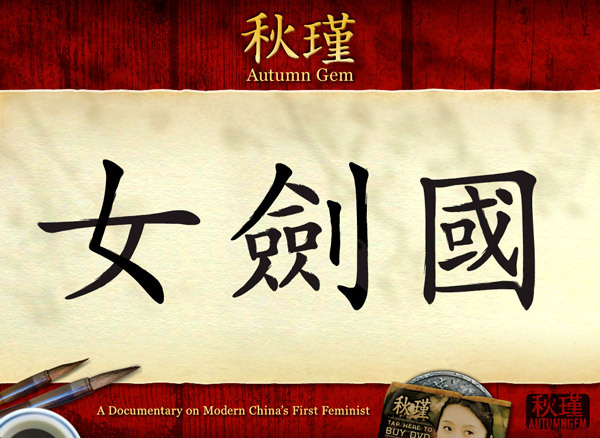 Using scholar interviews, archival materials, and dramatic recreation scenes based on her original writings, AUTUMN GEM brings the story of Qiu Jin to life. The hour-long film was produced and directed by two San Francisco Bay Area Chinese American filmmakers, Rae Chang and Adam Tow. 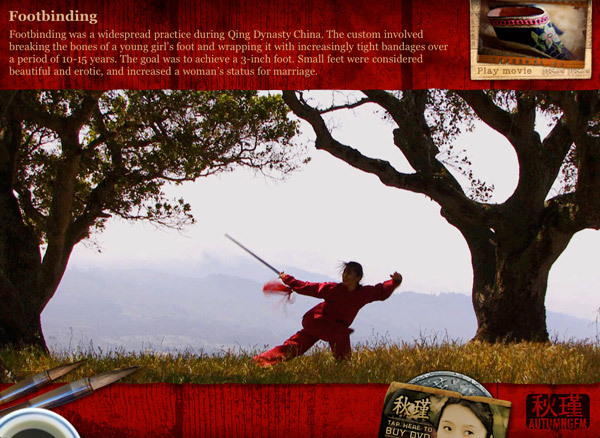 It stars former China National Martial Arts Champion and Hollywood stunt actress Li Jing. Autumn Gem Preview was developed in concert with Ivan Torres and Dominic Tham from XBureau during the inaugural iPadDevCamp in 2010. In true BarCamp tradition, we met randomly on the first night of iPadDevCamp. Over the next two days, we developed a working prototype that won the Promote-A-Book Future of Publishing award at the conference! XBureau then polished the app in the ensuing two months prior to its release on the App Store on June 19, 2010.